Mexicans like a meal of rice topped with a mouth-watering gravy! Rice with other ingredients mixed in, is also used as a stuffing for burritos. Try some of Mexico’s rice wonders like the Coconut Curry with Fried Rice , Mexican Fried Rice, and Mexican Rice. Of Mexican origin, this dish has travelled across the globe and won many fans! Coconut Curry with Fried Rice is relatively easy to make. The rice is prepared quickly and easily by tossing it in butter, with spring onions and a seasoning of salt and pepper. Each portion of rice is topped with a luscious Coconut Curry, which houses myriad colourful veggies, and is flavoured excitingly with a paste of red chillies and garlic. This mexican rice is a quick version and very easy to make. . . It has ingredients which are readily available. All age groups will surely relish this recipe. . . 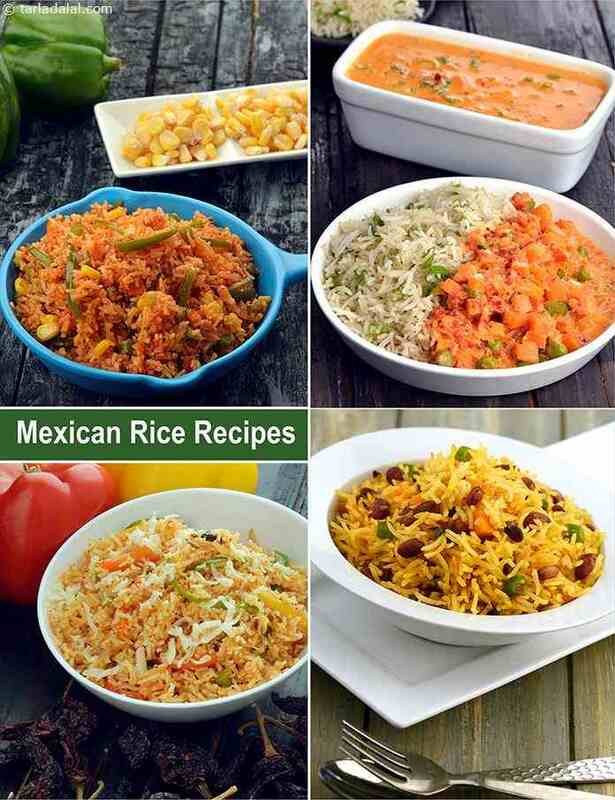 This rice can even be enjoyed in tiffin boxes. . . .
Mexican fried rice is a Mexican cuisine inspired rice recipe. The rice is roasted in a skillet with onion and garlic until golden brown and then steamed with tomato puree and spices. Discover an easy way of preparing delicious Mexican fried recipe with this simple rice recipe. Discover the superb taste of Colorado Mexican rice, a rice recipe which has been flavored with a blend of pureed roasted vegetables and stir fried with peas, carrots, and tomatoes. Melted cheese as topping simply finishes off this irrestible dish in a true culinary delight.